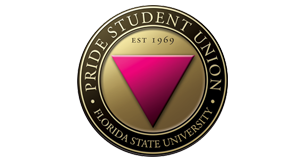 Established in 1969, Pride Student Union is Florida State University’s largest and most prominent LGBTQ+ student-run organization. We are one of the six Executive Agencies of the Student Government Association. Our mission is to advocate for, empower and provide community spaces for lesbian, gay, bisexual, transgender and queer people in Tallahassee. We are located in the Agency Space on the fourth floor of the Thagard Building while the Union is under construction. Pride Student Union emerged in 1969 as the People’s Coalition For Gay Rights in response to the Stonewall Riots, known by many as the catalyst of the LGBTQ+ rights movement. The People’s Coalition For Gay Rights changed its name several times throughout the 1970s-2000s, finally becoming Pride Student Union in 2005. Under these many names, Pride has advocated for LGBTQ+ rights on campus and in the local community. We convinced campus officials to include sexual orientation and gender identity in FSU’s non-discrimination policies, and won the fight for the creation of All Gender Restrooms on campus. Additionally, Pride has long worked with legislators to advance LGBTQ+ equality at the local, state and national level. Today, Pride continues working towards LGBTQ+ equality and provides programming for students to get involved with the LGBTQ+ community.